Mad libs is one of the funniest and most hilarious baby shower games. It often gets really nonsensical but that is actually the purpose of playing this game. I have made two mad libs games for my website. 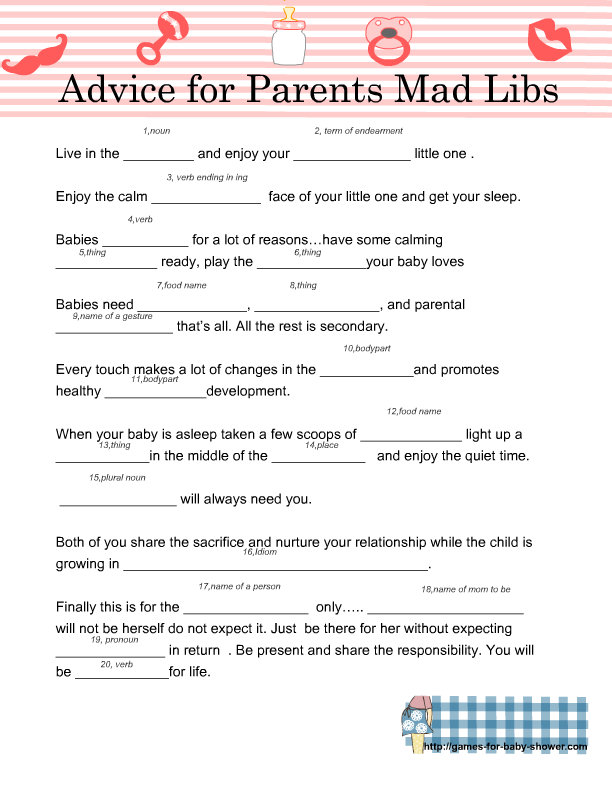 On this page I am sharing Free Printable Baby Shower Mad Libs ( Advice for the Parents). The purpose is to write a funny advice for the parents-to-be. How to Play 1: You should take a print out for just one set of sheets in the color of your choice. 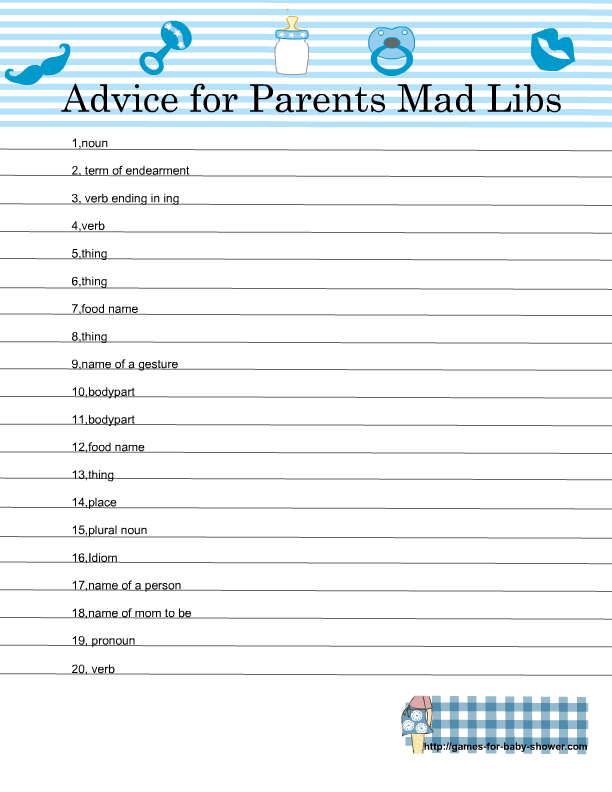 Ask all the guests to complete the second page by adding verbs, adverbs, nouns, etc. 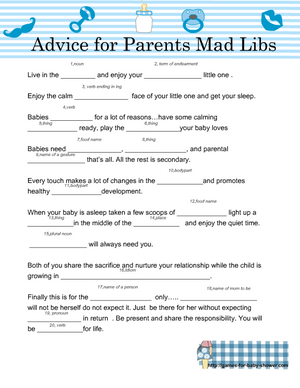 After that place those words in the first sheet to make a comical advice for the parents-to-be and read that aloud. How to Play 2: You can also print both sheets according to the number of the guests and give each guest gets a copy of second page to complete with verbs, nouns, adverbs, etc . Once they are all done with sheet no. 2, the host gives each person the first sheet. . Do not give them both sheets at the same time – it is less fun that way. The guests are then to copy their words from the second page, onto the first page. This is often hilarious and nonsensical, too. Each person is to read their rendition to the group. Here are two free printable mad libs game cards in yellow color. You have to click on each sheet separetely in order to get the bigger printable image. You can print just one copy of this game if you want to play it by using the how to play method no. 1 or you can print these according to the number of the players. This game card is decorated with cute baby related objects and horizontal lines. 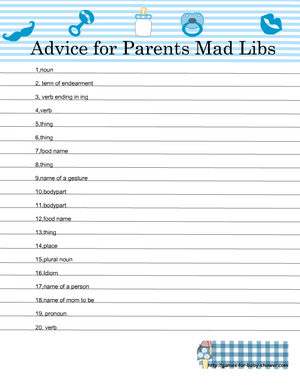 Here is the second set of these funny and hilarious mad libs game cards. This set of games is in blue color. Just click on each of the game cards and a bigger printable image will open up. Save that image or print it. Hit the back button on your browser after that so you can return to this page. 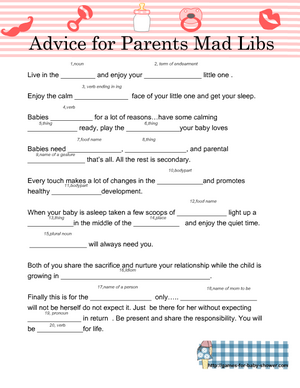 Here is another set of this advice for parents mad libs game for your girl baby shower. You can save it or print it by just following the method that I have mentioned under the game that I have shared above.